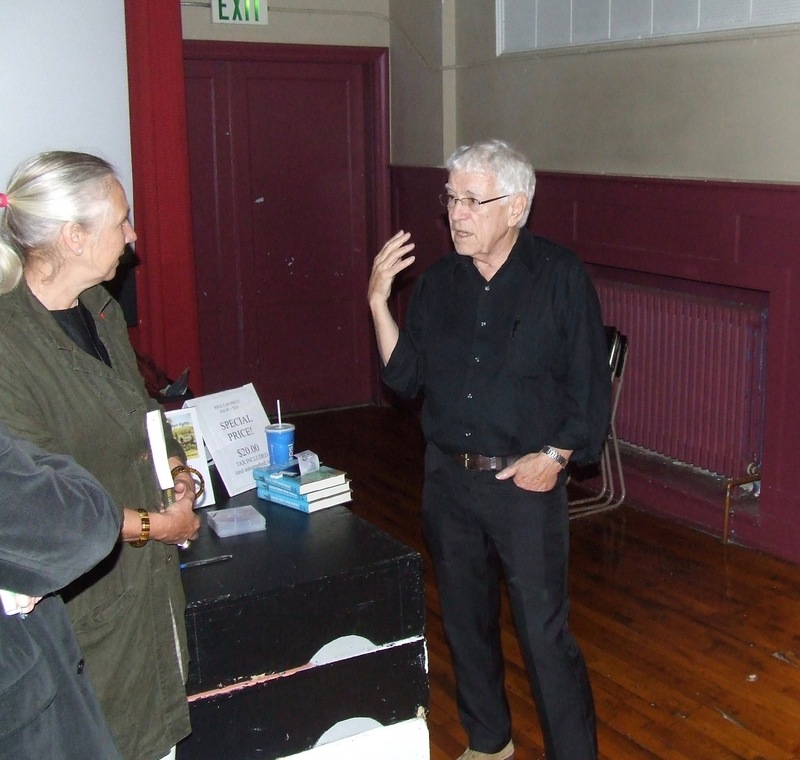 Journalist Silver Donald Cameron was answering questions after showing his film on green rights at Sackville’s Vogue theatre on Monday night when Roy Ries spoke up about suing the federal government to save the planet. Ries, who helped lead the fight against shale gas fracking in New Brunswick, mentioned a case in Oregon in which 21 young people are suing the U.S. government for failing to do enough to prevent catastrophic climate change. Silver Donald Cameron agreed that challenging the federal government in court under the Charter would be a good idea. In his film, Green Rights: The Human Right to a Healthy World, Cameron shows that when 900 citizens in Holland sued the Dutch government for not doing enough to limit greenhouse gases, the court responded by ordering the government to cut emissions by at least 25 per cent within five years. Cameron acknowledged, however, that building a coalition to organize and finance a Supreme Court challenge can be difficult in a big country like Canada with scores of environmental groups scattered widely across the country. During an interview later, Roy Ries said a Supreme Court challenge would need to emphasize that climate change puts lives at risk all over the world. “It is so urgent that we act immediately to shut down the fossil fuel driven economy in order to save millions and millions of people in the world,” he added. “It requires a group that’s willing to raise enough money, and it’s not a lot of money, a hundred thousand dollars would do it, but you need a group that can assemble the scientific evidence of the threat,” Ries said. In 2014, the New Brunswick Anti-Shale Gas Alliance launched its own lawsuit against fracking. But Ries says he believes that such provincial lawsuits wouldn’t be necessary if a national coalition of environmental groups could win a climate change Charter case in the Supreme Court of Canada. Meantime, Sackville Councillors Megan Mitton and Bill Evans, who watched Cameron’s green rights film at the Vogue, said afterwards they were impressed by the number of victories environmental groups are winning all over the world including the one by the anti-fracking alliance here in New Brunswick. Councillor Mitton said, however, the film shows how much work there is left to do. “It also made it clear just all the different roles that different citizens can play,” Mitton added. “So there are people who maybe run for office, like me, like Councillor Evans. There are people that are out there on the highway, people willing to get arrested, and then there are the lawyers that are in the courtrooms,” she said, adding it’s important for people to take action on behalf of the environment. “When you do that, good things can happen,” Mitton said. This entry was posted in Environment and tagged fracking, green rights, Roy Ries, Silver Donald Cameron. Bookmark the permalink. Thanks to the New Wark Times for these two articles on Silver Don Cameron’s interesting film on Green Rights. Now is the time to be thinking in terms of the next elections, making sure that we insist that this be an election issue and then vote for those politicians who will support a true movement for Green Rights here. No more will the people of our province put up with a government that bullies and blunders environmental degradation upon our children’s legacy. Thank you, Silver Don Cameron, for this well-researched, well-documented piece of work that you have carefully given your time, expertise and determination to produce for us all to learn more. Thanks also to those local people and groups who chose to support the production and presentation of this film. As Megan said, there are so many ways that people can help. It is remarkable what people can achieve when they come together…Bravo to Journalist Silver Donald Cameron for his talent and for our genuine advocates of the environment (of course, like with religions, some are more illuminated than others :)). Seriously, we should all be concerned about our environment regardless of any underlying preferred colour (green, red, orange, or blue). Thank you/bravo for this article and for the earlier one. However, reading this one, I cannot help not to pause to reflect about the following: With all due respect, to me, vicious corruption in our province is much more dangerous than this topic (unless the two are related, which remains possible). I personally would prefer seeing the lawsuit to the Supreme Court against our town succeed before thinking about the one proposed in this article. I think its impact (if by any chance it would be heard) would be compelling. Not because the environment is not important but because ending corruption is more critically urgent to give hope of dignity and public justice to NB citizens… This is crucial for their survival. Then, we can think of their health and quality of life. To conclude, I find it somehow ironic how Councellor Bill Evans used a description that fits so well the corruption pyramid too: “I realize in Canada, we have the inverted pyramid in terms of you have the corporations at the top, the individuals and then the group, the collective down below,” Evans added: “I think it should be the other way around.” I totally agree with him but I just feel like replacing *corporations* with *corruption*… To be more explicit, some sadly (whether abroad or here) only know how to govern like a corrupt corporation… Others accuse town’s people of misconduct when they denounce it. This being said, I have nothing against corporations. Nothing against governments. Nothing against Town Halls. On the contrary, they can be successful (and even admirable!) when they genuinely respect the whole persons (= with their environments)– whether they earn a living from or employ, serve or collect taxes from. I will stop here, clarifying that this is my personal opinion (in case Mr. Bruce you would publish my comment). Thanks again.